Now You Can Enjoy Healthy Asian Street Food At Home. Chinese, Asian and Thai street food come together at Live Wok in Gurgaon. This place serves healthy oriental street food. A restaurant, which provides you with healthy street food at minimal rates, Live Wok is a hidden gem tucked away in Unitech Infospace. It’s a pleasure to watch the chefs prepare your food at their live stations. The ingredients used are fresh and their portions are generous. You can mix and match ingredients and prepare your own noodle or rice box. They’re known for their speedy delivery, so if you’re craving some street food, you can be sure it’ll reach you quick enough. We recommend you try their fish grill, dumplings and their date pancakes. Get creative with your customised noodle/rice box. They even deliver your meal in cute customised boxes. Their food is priced pretty decently, so it’s easy on the pocket too. 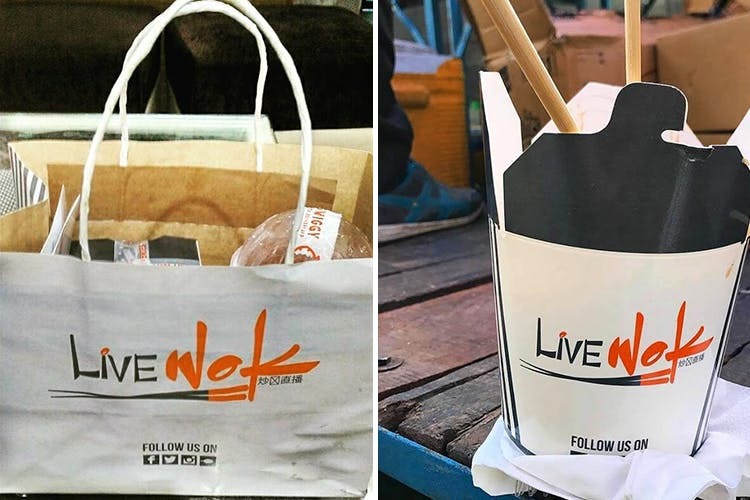 Next time you’re craving Chinese food, order a healthy and tasty meal from Live Wok.